Quality security solutions for your commercial and domestic requirements throughout Melbourne. Quality intercom systems for Melbourne based homes and businesses, provided at competitive rates by the expert team at Twenty First Security. * Our free quotes are available for select suburbs within our service area. To see if you're applicable for a free quote and to find out more, please contact us. It has never been easier or more affordable to take the security of your home or business into your own hands. Businesses across Australia are suffering the costs of vandalism, theft, harassment and other criminal acts, and it can be difficult for law enforcement to control and minimise these problems. Civilians having video footage, safe communication methods and alarm systems can assist the police greatly. Installing an intercom system is one of the initial steps to obtaining access control over commercial and residential properties, offering a safe and economical security solution. What Are They and Why Do You Need One? An intercom system is a two-way electronic device that transmits and receives audio/video communication. For businesses, an intercom is more than a simple way to communicate internally. You can enhance your security with a door-release feature and a speaker located at the front and/or back entrance, letting you see and speak with visitors before allowing them to enter. Having control over who enters your property will ensure the safety of your assets, your employees and the building itself – once a criminal is aware of the access points and notices the lack of security around your premises, they will gain continuous entry in the future. Twenty First Security in Melbourne will listen to your individual needs and install advanced audio and video technology that will instantly increase your safety. Without an intercom system, visitors can come and go as they please. This may not seem like a problem but when you grant unauthorised access to your building, you could create a liability issue in the case of an emergency. Melbourne is not free of criminal activity. There were around 45,100 cases of burglary/breaking and entering in Victoria from April 2017 to March 2018. Without adequate safety, you increase your chances of burglary, trespassing and vandalism. 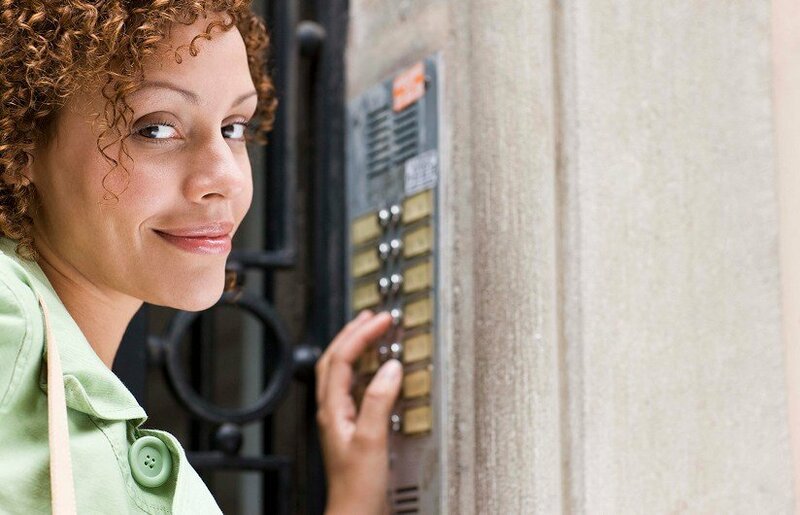 An intercom ensures communication with, and identification of, every single person who comes to your door. The low, initial cost of installation is worthwhile because it removes the need for security guards or additional receptionists placed by the door to check and identify visitors. You can also customise your system to include hands-free access, a doorbell, and communication features that easily connect employees throughout your workplace. The main goals of modern security systems are to be secure, reliable, simple to use and affordable. In addition to restricting access to staff and visitors, you will be able to keep track of who enters what area, and when and how long they are there via a computer log or instant printout. Keeping detailed records can help in the case of security breaches, and you can also ensure all of your business operations are occurring at the right times. Couple your intercom system with a Twenty First Security alarm system to create an strong barrier for unwanted guests. When your building’s security is completely integrated and focused on energy management, you can reduce your overall running costs. A safe and secure working environment will positively affect productivity while reducing losses, meaning higher profits in the long run. There is a variety of systems available on the market; however, Twenty First Security can help you choose the perfect option by assessing your risks and the size of the business. Whether you choose a wireless or wired intercom, our team will install it for you and ensure you are completely comfortable with how to operate it. We also service and maintain existing security systems. In some buildings, it just isn’t feasible to run wires through and over the walls. In these cases, a wireless system may be the best possible solution. Two-way wireless communication can include handheld radios, outdoor wireless callboxes and traditional desktop devices, varying in range depending on the level of technology. When it is possible to run wires between separate locations in a building, wired intercoms increase your privacy and prevent neighbouring systems from interfering. Additionally, if you are interested in installing a video system, the best solution is usually a wired unit. These units will typically have a camera, speaker, an internal monitor unit and a push button at the door entrance. It is more challenging to send video at a distance via wireless technology so it’s more reliable and simple to use a wired intercom. Landlords and body corporates can make their apartments or commercial buildings more appealing to tenants and corporate renters by installing additional, simple-to-use security methods. Intercoms have come to be expected by most professionals so installing one in your building will attract more successful, stable and sizeable companies at higher prices. Many homeowners choose to take control of their homes and security measures by installing intercoms; they can screen their doors and identify visitors before allowing anyone to enter. For our previous clients with children, they were pleased to have a way to communicate internally instead of shouting after their kids at home. Intercoms allow comfort and peace of mind while you’re in your home and while you’re away. Twenty First Security’s access control systems offer extremely high levels of security to businesses in the Melbourne metro area and in some rural areas. Fast-paced business environments need uncompromising levels of security, paying attention to efficiency and sophistication. Not only do we offer state-of-the-art intercom systems, we can also assist you with CCTV, alarms, monitoring services, and much more. When it comes to safeguarding your home or business, limiting access to your premises is of paramount importance. The best way to deter thieves and vandals is to make it extremely difficult for them to find their way into the building. If you’re in any way concerned about the safety of your commercial premise, let Twenty First Security come and assess your needs so we can offer bespoke and affordable solutions. Protecting your employees and assets is crucial to running a safe and stable business. For more information on any of our products, including intercom systems, don’t hesitate to get in touch. Call us now on 1300 315 522 or contact us online. We service the Melbourne VIC area and offer free on-site quotes to select suburbs. With a time proven reputation for reliability and quality. © 2015 - 2019 Twenty First Security. Private Security Business Licence Number 909-540-81S. All rights reserved.